@BifBangPow: Comic-Con Update: Meet Scott Ian! Comic-Con Update: Meet Scott Ian! Scott Ian visits the Entertainment Earth booth #2343 at Comic-Con 2008! He'll be there to say hi to fans, and to sign his all-new bobble head, making it's debut at Comic-Con. Exact appearance dates and times to be announced. From Anthrax rocker to bobble head! Bif Bang Pow! 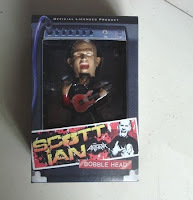 brings Scott Ian to the world of collectible figures for the very 1st time with this rockin' resin bobble head that stands 7-inches tall and comes in an awesome "guitar amp" window-box package. If you're a faithful fan of this talented man and his music, you just gotta get this! Check out this photo of the all-new Scott Ian Bobble Head. Packaging revealed for the first time, right here!